Specially designed for reactive oily skin and skin sensitised by anti-acne treatment.regulates and soothes the skin of the face and body. Its well-tolerated, soap-free formula and gentle cleansing base safely cleans the skin.A simple, pleasant way to prepare the skin for dermatological treatment.Purified, soothed and balanced, the skin is left soft and clean. 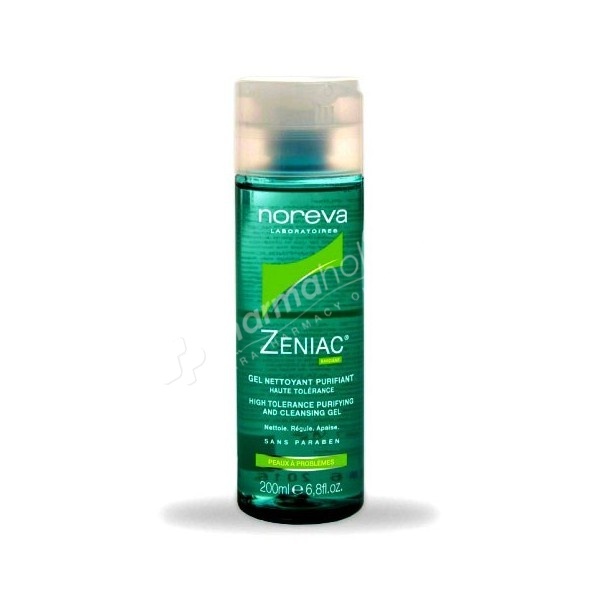 Especially conceived for reactives oily skins and the skins weakened by anti-acne treatments, Zeniac Gel Purifying is a soap free cleansing gel which offers a high tolerance. Burdock and the biotine limit sébaceous secretions. Zinc regulates the bacterial flora. Purified, soothed and its balance restored, the skin regains its softness and a clear aspect. With a simple and pleasant gesture, purifying gel prepares the skin for dermatological treatments. Apply on face moistened. Rinse thoroughly with water and dry the skin. Aqua, cocamidopropyl betaine, decyl glucoside, glycerin, PEG-40 glyceryl cocoate, PEG-120 methyl glucose dioleate, propylene glycol, PEG-7 glyceryl cocoate, sodium sulfate coceth, Arctium majus, sodium methyl cocoyl taurate, imidazolidinyl urea, fragrance, tocopheryl acetate, zinc PCA, PEG-54 hydrogenated castor oil, PEG-15 hydroxystearate, phenoxyethanol, biotin, citric acid, sodium hydroxide, CI 42090, ethylparaben, methylparaben, propylparaben, butylparaben, limonene, linalool, hydroxycitronellal, citral, benzyl salicylate, alpha isomethylionone, hexyl cinnamal, citronellol.